Hello hello hello…. how’s everyone out there? Hope you are well and happy! It seems to be the season of sales here in Kuwait, everywhere you look there are hoardings announcing ongoing sales and newspaper pages are loaded with advertisements of sales here and there. It looks like many businesses in the country are vying with one another to offer the best prices to lure customers during the year-end holiday season. Have you been to the Avenues (Kuwait’s largest mall) lately? Well, we were there last weekend and I tell you… I can’t believe it… reductions are up to 50% -75% on Autumn/Winter fashion, Accessories, Furniture and other items. For customers, this is possibly the best time to buy as usually end-of-year sales are genuinely lower priced than at any other time during the year. Don’t you love this season? Because I definitely do! Okay… back to our recipe for today; Mini Murtabak. This is one of our favourite snack especially during Ramadhan. 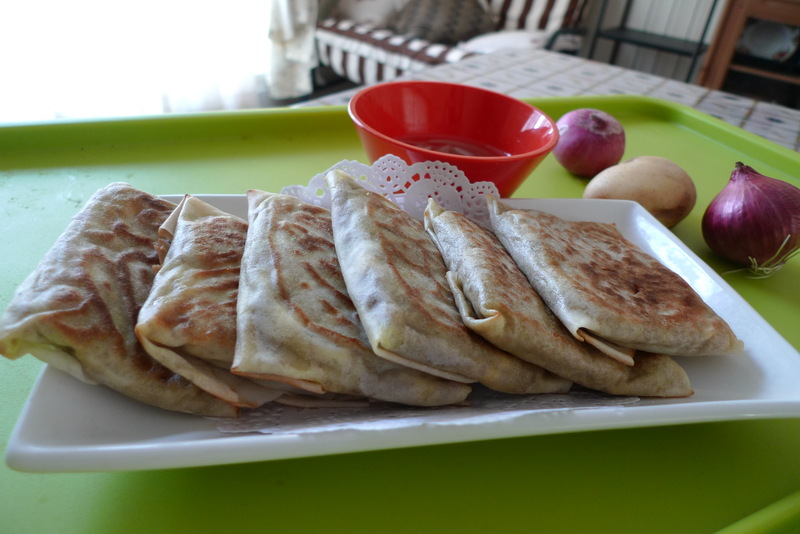 In this recipe I used the spring roll pastry simply because it is easy and the end result is still taste just like the real murtabak at Pasar Malam in Malaysia. Enjoy! Dipping : Mix everything in the bowl , taste and place it in the fridge at least 2 -3 hours before serving. Filling :- Saute the garlic and onion till fragrant. Add the kurma paste and cook for few minutes. Add the mince meat, diced potato and a little bit of water. Add sugar and salt to taste. Cooked till the meat is cooked and the potato soften. Set aside to cool. Divide the filling into 3 equal portions. Heat up a frying pan and pour about 1 tbsp of oil. Take one portion of the filling and mix well with one egg. 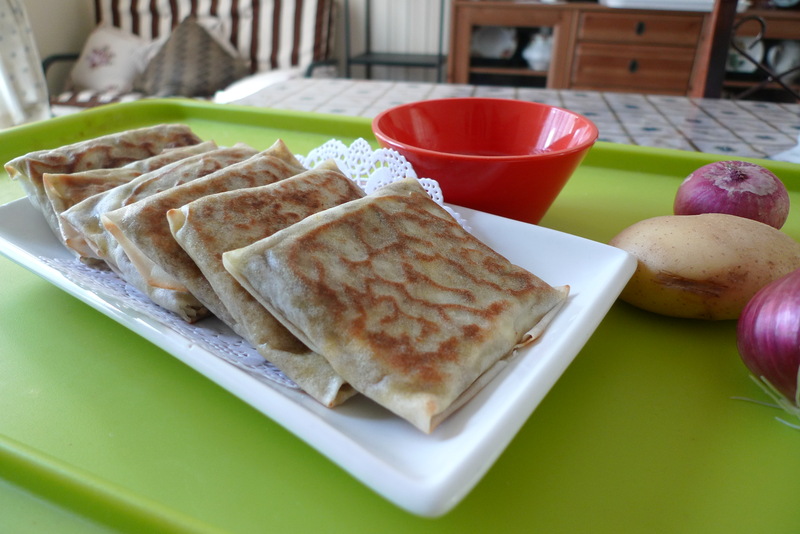 Take a piece of spring roll pastry and place about 1 1/2 tsp of filling mixture, fold into a rectangular shape and place it into the frying pan. Repeat the whole process. Cook the murtabak using slow fire till brown on both side. Serve with the dipping. Assalamualaikum and a very Happy New Year to all. I have been neglecting this blog almost 3 weeks now… well, with the kids at home for winter break, entertaining family visiting from Malaysia and not to mention my boy got sick again, I have no time at all to post anything. Anyway, life is almost back to normal, my boy is already at school and the girls will start school next Monday and my aunties and uncles already left… kind off miss them especially their cooking he he he. Believe it or not, the whole duration of their stay here, I do not have to cook at all… I know right… I’m suppose to be doing the cooking but it turned out to be the reverse… lucky me. Okay, yesterday I was kind off blur on what to cook for dinner, had enough with rice and wanted to do something different. So, as usual, I started browsing the net and came across this blog, my initial thoughts was “mmm… interesting!” and then I saw the “blog landlord”… I think I know her, so I posted a comment in her blog and true enough, she was my HR manager when I was a very young engineer in Honeywell 18 years ago. I’m so glad to stumble upon her blog… she used to bring her homemade “nasi lemak bungkus” to office for all of us… she is the best HR manager I’ve worked with. So this recipe is taken from her blog and it was a total hit, my other half and my 2 elder daughters love this. 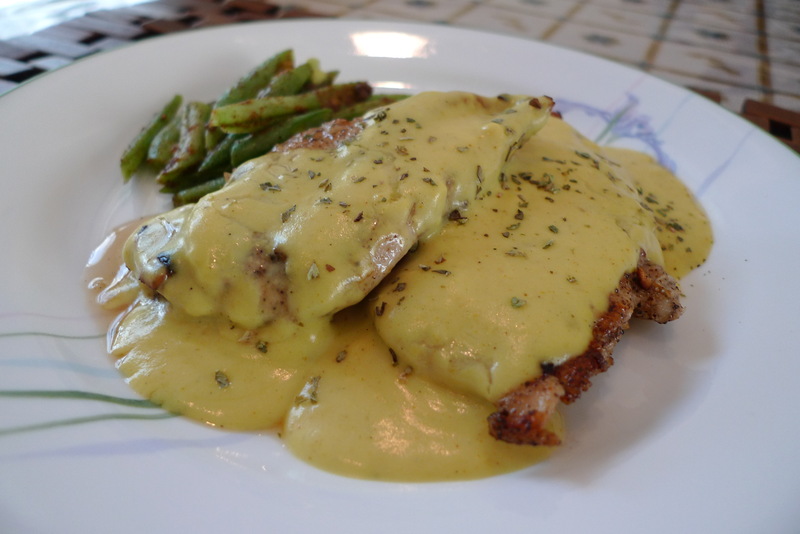 While chicken bakes, melt butter or margarine in saucepan. Add flour and stir for 1 minute. Whisk in milk, stirring until sauce starts to thicken. Remove from heat; stir in turmeric powder. hot pepper sauce, salt, and pepper. 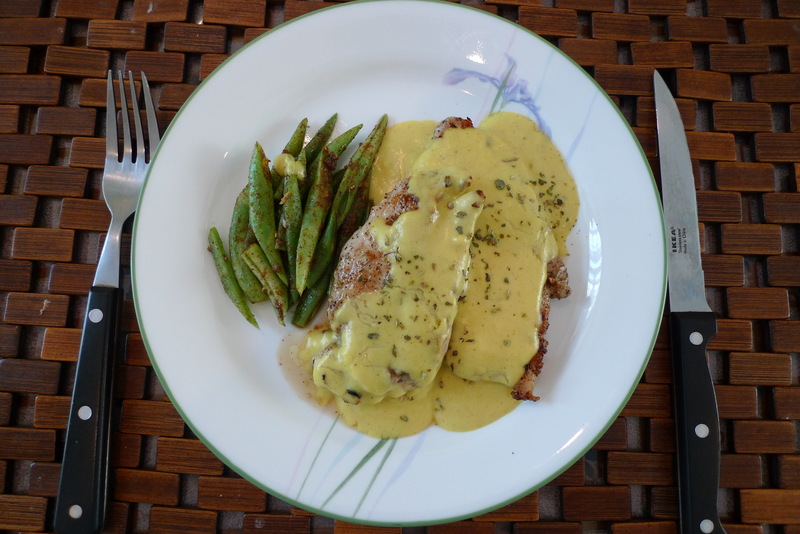 Arrange on a serving platter with sauce spooned over chicken breast halves. Garnish with steam vegetables of your choice.